In a world filled with cacophonous cries of rage masquerading as singing and interminable electronic thumping passed off as rhythm, it does the music lover's heart good to hear a living artist who still appreciates those rapidly vanishing attributes known as melody and sentiment. Sure, we have our Frank Sinatra memories and our Ella Fitzgerald reveries, our favorite Benny Goodman recordings and cherished Billie Holiday performances. But so many of today's musicians - if such a term can be applied to rappers and shouters and distortion merchants - seem oblivious to the beauty, the very real possibility of joy and pleasure, that heartfelt music can bring into our lives. How many times have you put an old Tommy Dorsey disc on the stereo and, letting the waves of music wash over you like a warm sonic sea, thought, "they just don't make 'em like they used to"? Well, Alan Kaplan still does. Welcome to Lonely Town, a place where love and regret, pining and rejoicing, and everything else that makes us human can be heard emanating from the bell of a trombone. This collection of timeless songs, arranged and performed by some of the Los Angeles area's best musicians, makes you realize all over again that beautiful music never completely goes away. It just waits to be rediscovered. 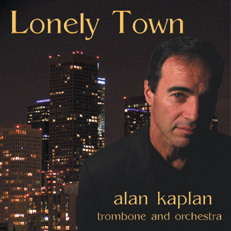 Kaplan's Lonely Town is the realization of a life-long dream. One of the entertainment industry's elite studio players - he can be hard on everything from Star Trek to The Simpsons, Barbra Streisand in Concert to Sleepless in Seattle - Alan Kaplan is accustomed to performing every kind of music imaginable. (The license plate on his car reads MANOWA, in tribute to the thousands of cartoons he's accompanied throughout his recording career.) But playing ballads is his first love. While most kids in the 60s were stamping their feet to the Rolling Stones, Kaplan was tapping his to bittersweet torch songs. Even as a lad in high school, the fledgling trombonist listened to every ballad record he could find, envisioning himself someday recording classic arrangements of classic songs with a classic orchestra. A musician since age eight, Kaplan tried to prepare for a "real" job, majoring in engineering at LA Valley College, but by 19 he was on the road with Buddy Rich, the youngest trombonist ever to play lead with that band. The next decade found him working with big band legends such as Harry James, Louis Bellson, Don Ellis and Lionel Hampton. 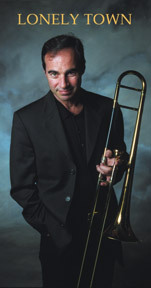 By the late 70's, Kaplan was being compared to trombone greats Carl Fontana and Frank Rosolino. And all the time he kept listening to those ballads. Dreaming. Never mind that T. Dorsey has been replaced by the likes of Snoop Dogg. In a place called Lonely Town, one man's dreams still come true. Bill Cunliffe, Tom Ranier, Bob Alcivar and Steve Bernstein. Carolyn Osborn, Pam Gates, Bob Peterson, Robert Gerry. Jodi Burnett. String Bass:Dave Stone, Chuck Berghofer.